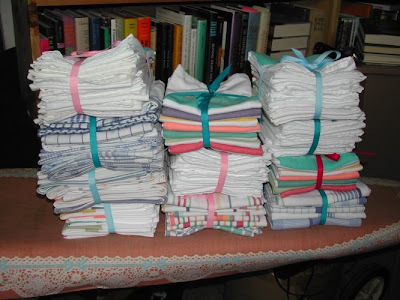 I received a lot of flack (OK, merciless teasing) from some people about my neatly bundled kitchen towels. Well, everyone needs a fresh and clean kitchen towel every day. That is seven for the week. Frankly, they are just easier to keep together if you wash, starch, mangle, and tie them into neat little bundles of seven towels. Trust me, you are washing and ironing them anyway... so just tie them together and you are ready for a new week in the kitchen. That flack, or merciless teasing, is envy!